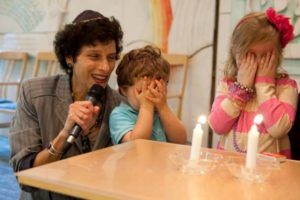 The observance of Shabbat is a central focus of our congregational life. We strive to offer our members a variety of worship experiences and Shabbat programs. All members are welcome to attend any of the services to sample the different ways we make Shabbat part of our weekly lives. Join us for our monthly Tot service at 6pm and plan to stay for the participatory dinner that follows. Join us as we celebrate Israel’s Independence Day with a special Shabbat service and festive oneg. We will also celebrate our outgoing Youth and Engagement Specialist Kelly Whitehead’s work at Temple Sinai, say farewell, and bless her as she prepares to begin rabbinical school at the the Hebrew Union College – Jewish Institute of Religion. Join our 10th Grade Confirmands as we celebrate their learning at Temple Sinai! Dinner RSVP link to come! Prozdor (appetizers) is offered for half an hour preceding all Early and Tot Shabbat Services. Oneg Shabbat follows all Late Shabbat Services. Service times are subject to change. Please check the calendar.